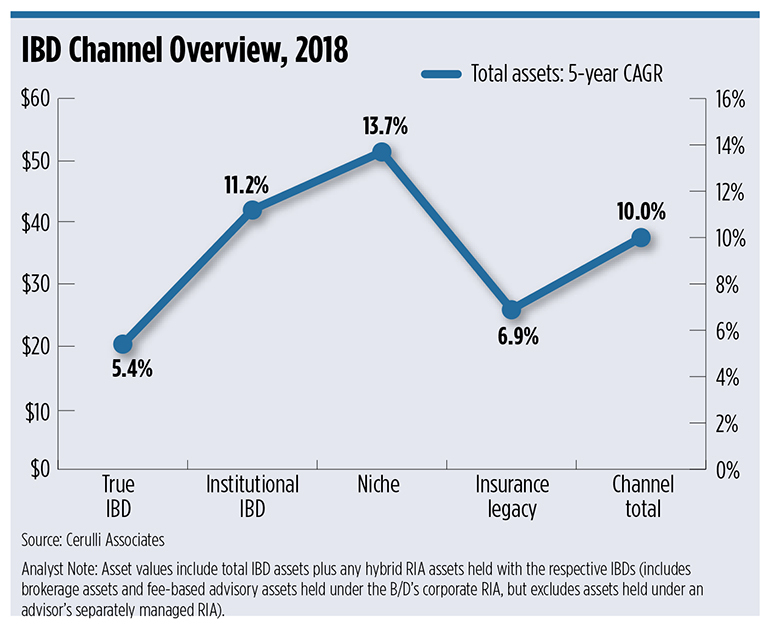 The independent broker/dealer channel is the fastest growing corner of the financial services world in terms of assets, with a five-year compound annual growth rate of 11 percent, according to a new report by Cerulli Associates. That compares to the four wirehouses—Morgan Stanley, UBS, Wells Fargo Advisors and Merrill Lynch—which grew assets 6 percent over that period. The momentum in the independent space continues into this year. The IBD channel is projected to gain $18.7 billion in assets this year, while the wirehouses are expected to lose $143 billion, Cerulli says. The registered investment advisory channel should gain $62.2 billion this year. Ed Louis, research analyst in Cerulli’s wealth management practice, attributes the growth to an increased desire for independence, as wirehouse advisors deal with more restrictions, increased production requirements and headline risk. “If you take a look back to when the DOL fiduciary rule was first proposed, lots of broker/dealers, especially when you look at the wirehouses and the national/regional firms, they started putting more restrictions on what FAs could and couldn’t do from an investment standpoint,” he said. “On top of that, you start adding on concerns for some people around increased production requirements, especially at the wires, where they’re looking to try to maintain record profitability again this year. The IBD channel has the second-largest advisor headcount, at 59,361, trailing only the insurance channel, Cerulli says. More than 68 percent of advisors said that if they were to change firms, they would go to an IBD, hybrid RIA or pure RIA. One-third of those folks said they would go to an IBD. While some of the asset growth in the IBD space is organic, much of it’s also advisors in transition. If you look at the type of IBDs, those with a niche—a focus on a certain product or service—such as H.D. Vest or Captrust, are growing the most. This subsegment grew 14 percent over the last five years. The institutional IBDs, which tend to have a corporate owner, such as LPL Financial, Ameriprise and Raymond James, grew 11 percent over that same period.